Amazon Connect runs on Amazon Web Services proven infrastructure operating 42 Availability Zones within 16 geographic regions around the world. This makes Amazon Connect more highly available, fault tolerant and scalable than would be possible if a contact center solution was run from a single data center. Operational CRM - The dashboard may provide client information, past sales, previous marketing efforts, and more, summarizing all of the relationships between the customer and the firm. Operational CRM is made up of 3 main components: sales force automation, marketing automation, and service automation..
Analytical CRM -Analytical CRM systems use techniques such as data mining, correlation, and pattern recognition to analyze the customer data. These analytics help improve customer service by finding small problems which can be solved, perhaps, by marketing to different parts of a consumer audience differently. For example, through the analysis of a customer base's buying behavior, a company might see that this customer base has not been buying a lot of products recently. After scanning through this data, the company might think to market to this subset of consumers differently, in order to best communicate how this company's products might benefit this group specifically..
Collaborative CRM - aims to incorporate external stakeholders such as suppliers, vendors, and distributors, and share customer information across organizations. For example, feedback can be collected from technical support calls, which could help provide direction for marketing products and services to that particular customer in the future. A Gantt chart is a type of bar chart that illustrates a project schedule. 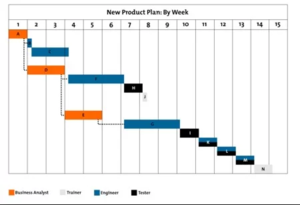 Gantt charts illustrate the start and finish dates of the terminal elements and summary elements of a project. Terminal elements and summary elements comprise the work breakdown structure of the project. Modern Gantt charts also show the dependency (i.e., precedence network) relationships between activities.